Six weeks ago, Andrew Thibodeau stood at a doorway. He slapped both sides of the door frame and then grabbed a pole to his right. A guy crouching behind him yelled “Get ready!” A moment later, that same guy slapped the back of Andrew’s leg. That was his signal to jump through the door. He was 1500 feet above a forest. “I was doing fine until I grabbed that pole,” said Andrew, telling the story of his first parachute jump during a 6-week training course at North Cascades Smokejumper Base just outside of Twisp, Washington. Today, the ProjectWA team was lucky enough to get a history lesson and tour from Andrew on his first official day as a rookie smokejumper. 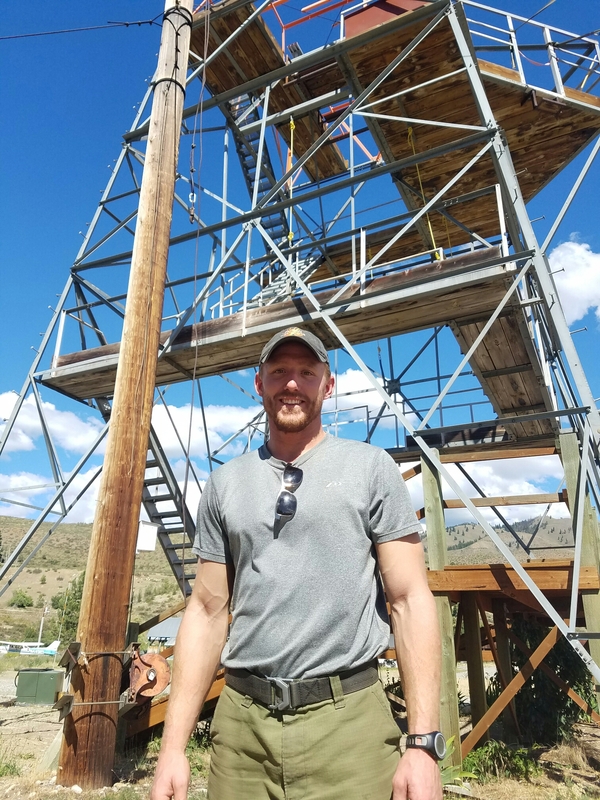 After a rigorous training, he joins an elite group of 25 other parachuting firefighters stationed at an airfield situated in the Cascade foothills. A CASA C-212 Aviocar sits ready to fly within 5 minutes of the alarm. The Methow Valley became the birthplace of smokejumping in 1939, when fire guards, Francis Lufkin and George Honey, made 58 experimental parachute jumps to determine under what conditions firefighters could safely land in inaccessible mountainous areas to fight wildfires. Lufkin, who had spent several years dropping supplies by parachute into wilderness fire areas, said, “If we can deliver boxes via parachute, why can’t we also deliver people?” Today, smokejumping is the most cost-effective wildfire fighting method employed in the U.S. More than 400 smokejumpers are stationed at nine main bases and dozens of satellite bases in the western U.S.
Francis Lufkin, ready for his first experimental jump in 1939. 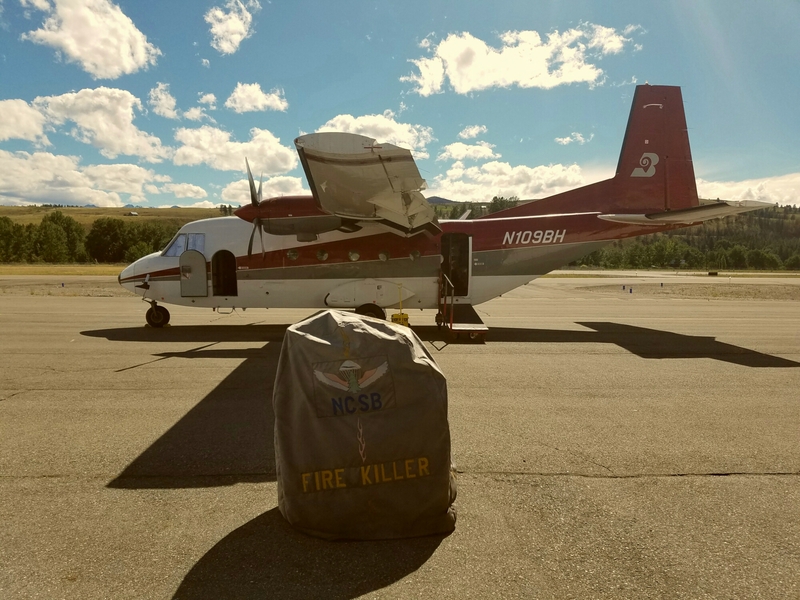 The critical role smokejumpers play in fighting wildfires has received more attention in recent years, as forest fires have increased in frequency and intensity. The 2015 Okanogan Complex fire was the largest in Washington State history. Most people don’t realize the other critical contribution smokejumping has made to history. Until 1939, people didn’t voluntarily jump out of airplanes. Parachutes were for in-air emergencies, usually at high altitudes. 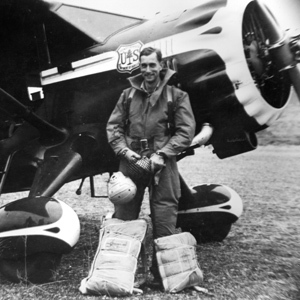 Francis Lufkin’s new firefighting method demonstrated the feasibility of parachuting from low altitudes, with extreme precision, into a hostile environment. 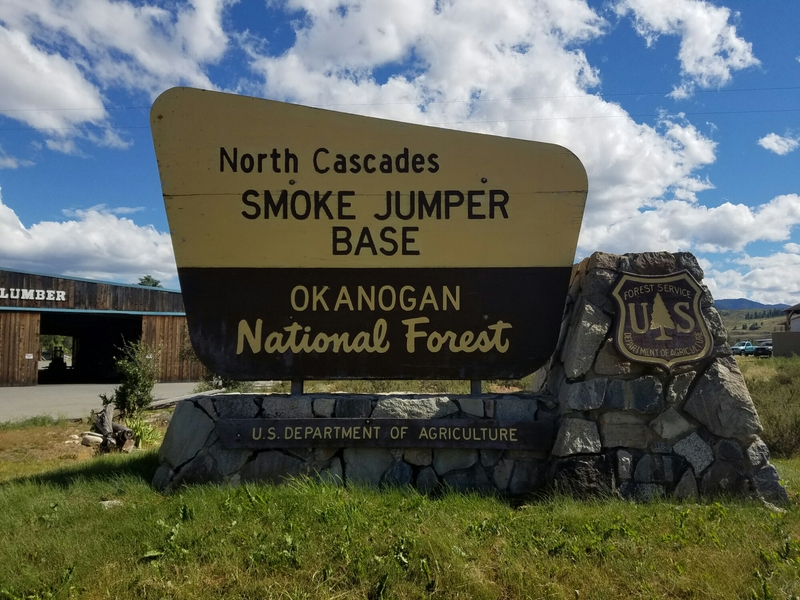 In 1940, U.S. Army Major General, William C. Lee, visited the North Cascades Smokejumper Base to better understand how this new skill could be used for military purposes. Later that year, Lee became the first commander of a new parachute school at Georgia’s Fort Benning, which became the U.S. Airborne Command. Paratrooping was born. Four years later, 13,000 American paratroopers made night drops during D-Day, which turned the tide of World War II. After taking Andrew’s tour, I understand the similarities between preparing for war and training to be a smokejumper. As if parachuting and firefighting aren’t hard enough, smokejumpers must also be expert rappellers and tree climbers. Though landing in meadows is the goal, sometimes they land in trees; so smokejumpers have to be in great physical shape to first get themselves untangled and then make their way to the ground, sometimes 40 feet below – all while wearing Kevlar jump suits and a 100 pounds of gear. They can’t just leave their chutes in the tree, which means climbing back up to retrieve them. Once on the ground, parachuters turn into fire fighters and survivalists. They bring supplies that allow them to fight fires for as long as three days: axes, chain saws, shovels, food and drinking water. Everything gets dropped in boxes at the same time as the smokejumpers. The firefighting is done by digging 18-inch-wide paths, creating lines around a fire area – effectively starving the fire of the vegetation that fuels it. After a few days of nonstop work, the crew has to hike to the nearest accessible road to be picked up. The job doesn’t end when smokejumpers get back to base. The work simply transitions into other tasks so that the crew is prepared for the next jump: sewing up ripped chutes and suits, packing boxes with gear, food and water; and packing parachutes. All so that, within 2 minutes of the alarm, smokejumpers are suited up and on the plane. Then there’s all the other chores associated with day-to-day living. 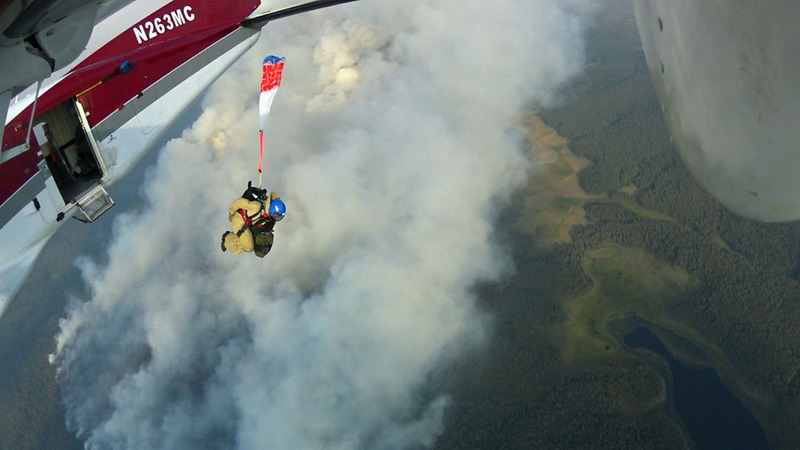 Smokejumpers are self-sufficient on – and off – the fire line. They cook for themselves, tend their own garden and mow the lawn. And they sew. 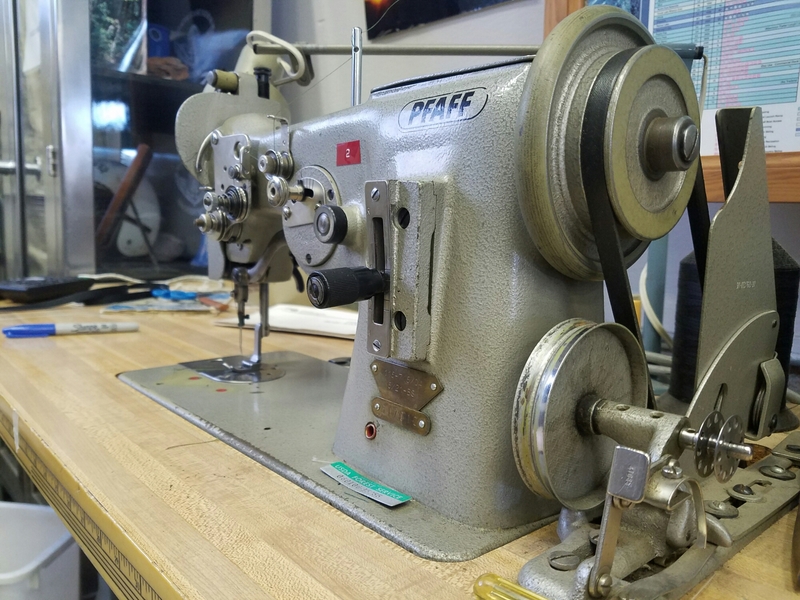 Every smokejumper knows how to operate a sewing machine – a tool just as critical to the whole operation as axes, shovels and airplanes. With an average of 45 jumps per year (the record is 1066 in 1970), chutes and suits get torn and have to be immediately, expertly mended. I was surprised to learn that all the gear – shirts, suits, pants, and chutes – is made by smokejumpers right there on the base. One of the most important smokejumping tools. There were many things that impressed me about smokejumpers. What struck me most is their culture of complete trust and reliance on each other. Every smokejumper knows how to do every job on the base – from sewing and packing chutes to being the “JIC” (Jumper in Charge). It’s all about efficiency. When every second matters, there’s no time for figuring out who within a jump crew has seniority. Whoever is in the seat closest to the airplane door automatically plays the role of JIC – whether they are an 18-year veteran, like Kathlyn Russel, or a brand new rookie, like Andrew. So who is in charge of the smokejumpers, overall? They are part of the U.S. Forest Service, which is run by the Department of Agriculture. Though they are federally funded, there are gaps. The smokejumpers sell souvenirs to raise money for the Fallen Firefighters Fund (I bought myself a cool smokejumper coffee mug). If you are anywhere near the Methow Valley, the North Cascades Smokejumper Base is a must stop. You’ll get one of the best free tours around, learn some important history that’s relevant to all of us, and get a chance to thank a group of individuals that put their lives on the line to keep us all safe. Before you go, download the Washington State Insider app so you can get your points for visiting. As of June 23, 2016, the jump counter is still set at 0. The average number of jumps per year is 45. Extremely interesting inside facts that keeps Washington State safe and the hero’s that have passed on their talents and bravery to others in the USA! Thanks Project Wa. For pioneering the ” The great and interesting places to visit in Washington state!! Fascinating! This is the best blog ever!